What did the early Egyptians know about electricity? Is it possible that they understood the concept of atomic energy? In the thought-provoking book Electric Ancient Egyptians: Manipulating Atomic Structure with Human Electricity by James Ernest Brown, these topics are considered and hypothesized. Using the substantial amount of data and documents that he has accumulated and studied over several decades, the author has come to some astounding conclusions. The electrical energy that the human body, animals, and plants contain could be captured and used as a viable source of energy. Formulas coordinating astrological itineraries and using what we know as Faraday cages were part of Egyptian rituals. Is it possible the pharaohs knew how to harness and use the energy that circulates through human bodies? 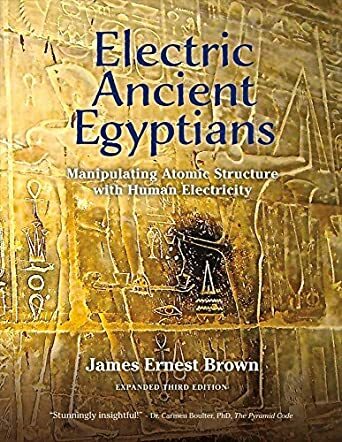 Electric Ancient Egyptians: Manipulating Atomic Structure with Human Electricity by James Ernest Brown is a stimulating, educational book with an enlightening and clever twist. The unique ideas presented are extraordinary and may seem outlandish, but the author backs his theories with diagrams, pictures, illustrations, and simple logic. With a minimal understanding of science, it is an enjoyable book that is straightforward and easy to comprehend. Because the subject delves into ancient Egypt and the inconsistencies of Egyptology, defying modern scientific thought, I recommend this illuminating book to fans of Robert Bauval and Graham Hancock. The book has an outstanding and novel scientific approach to creating energy, and anyone who loves mind-bending knowledge will relish the compelling the way Mr. Brown thinks outside the box, and will appreciate his ingenuity and lateral thinking.